Music not played by traditional musicians, or created in unique ways. The Thai Elephant Orchestra and Da Hiphop Raskalz get their own devoted webpages. From a poll of American musical preferences in 1996, lyrics by Nina Mankin, music by Dave Soldier. Komar and Melamid were making paintings determined by national surveys. 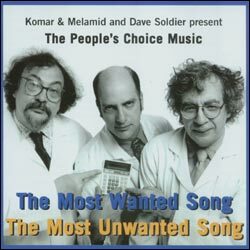 I wrote the survey and wrote the Most Wanted Song and the Most Unwanted Song. See portions of the survey, or buy the CD and see them all displayed. This survey confirms the hypothesis that today's popular music indeed provides an accurate estimate of the wishes of the vox populi. The most favored ensemble, determined from a rating by participants of their favorite instruments in combination, comprises a moderately sized group (three to ten instruments) consisting of guitar, piano, saxophone, bass, drums, violin, cello, synthesizer, with low male and female vocals singing in rock/r&b style. The favorite lyrics narrate a love story, and the favorite listening circumstance is at home. The only feature in lyric subjects that occurs in both most wanted and unwanted categories is "intellectual stimulation." Most participants desire music of moderate duration (approximately 5 minutes), moderate pitch range, moderate tempo, and moderate to loud volume, and display a profound dislike of the alternatives. If the survey provides an accurate analysis of these factors for the population, and assuming that the preference for each factor follows a Gaussian (i.e. bell-curve) distribution, the combination of these qualities, even to the point of sensory overload and stylistic discohesion, will result in a musical work that will be unavoidably and uncontrollably "liked" by 72 plus or minus 12% (standard deviation; Kolmogorov-Smirnov statistic) of listeners. The Most Unwanted Music is over 25 minutes long, veers wildly between loud and quiet sections, between fast and slow tempos, and features timbres of extremely high and low pitch, with each dichotomy presented in abrupt transition. The most unwanted orchestra was determined to be large, and features the accordion and bagpipe (which tie at 13% as the most unwanted instrument), banjo, flute, tuba, harp, organ, synthesizer (the only instrument that appears in both the most wanted and most unwanted ensembles). An operatic soprano raps and sings atonal music, advertising jingles, political slogans, and "elevator" music, and a children's choir sings jingles and holiday songs. The most unwanted subjects for lyrics are cowboys and holidays, and the most unwanted listening circumstances are involuntary exposure to commericals and elevator music. Therefore, it can be shown that if there is no covariance—someone who dislikes bagpipes is as likely to hate elevator music as someone who despises the organ, for example—fewer than 200 individuals of the world's total population would enjoy this piece. The pieces are either "unconscious music", where one composes without being aware of creating the music , or "prosthetic music" in which you attempt to control your brainwaves (e.g., closing your eyes is a classic way to control alpha waves). Features Valerie Naranjo (gyil, an African mallet instrument), Barry Olsen (hand drums), Benny Koonyevsky (cajon, a musical box), each triggering brainwaves: this is all in real time with no overdubbing. String Quartet #3, "The Essential"
academic lectures by Dr. John Krakauer and myself on music and brainwaves from the City University of New York concert (just the lectures, no music). This radio program (40 minutes, Septermber 2011) titled Timeless Music made for Vicki Bennet at WFMU radio, explains the physical dimensions of music and how to manipulate them, with musical examples. For recorded music, the dimensions are air pressure amplitude and time: for composed music, frequency and time. We play with these dimensions, for example using fractal patterns with partial dimensions, so that issues like tempo become undefined and the length of music ambiguous. The show includes explanations / illustrations of how to make deliberate fractals in music, Fourier transform music and an straightfoward explanation of white noise. the variations on Chopin's Minute Waltz, just below, using integrals, derivatives, averages, and more. My third string quartet, "The Essential" with mathematical variations on the second movement of Arnold Shoenberg's Second Quartet: it can be heard and the score downloaded from Scores. It includes a derivative movement, an integral (very short), a fractal movement, and a Fourier transform. Olivia Porphyria, a fractal on Haydn's name, from Organum can be heard and the score downloaded from the Scores page. Here are scores for two fractal pieces for trombone and two guitars, Fractal on the Name of Haydn and Fractal on the Name of Bach and there is a solo piano version on the Scores page. The most straightforward is the Fractal Varation in "The Essential Quartet" (Scores page) which is easier to follow and is equivlanet to a Koch snowflake. integrate the original scale, and you'll see that integrals of the music rapidly go beyond the range of hearing! Examples are in the Essential Quartet and the Chopin Variatins below, both with very short integral movements. An old joke is on the order of "it takes him half an hour to play the Minute Waltz". For the 9th variation, here is a live performance of a collaboration with the late Frederic Chopin and living electronic musician Sean Hagerty. Dave Soldier performs the Minute Waltz on the grand piano at Le Poisson Rouge very very slowly, lasting more than twenty minutes, while Hagerty stretches the sound of each piano note out over time. Variation 1 averages all pitches played at a time, so that when two or more notes are played in the original, the average of the notes is played instead. For example, the average of C and C# is C and one quarter tone sharp. Variation 2 uses all pitches in an octave that moves in parallel with the composed pitches, but with the original written pitches removed. The original is in Db, so you hear the piece simultaneously in C, D, Eb, E, F, Gb, G, Ab, A, and B. Variation 4 uses the pitches in each measure played with volume depending on how loud and long each pitch is represented in that measure, so that volumes represent the power in each frequency in bins of a measure. Variation 8 is literally a mathmatical integral of the score: if the derivative is made of this integrated variation, the original piece reappears. The derivative of the piece also sounds pretty cool, and I'll add it eventually to the list as Variation 8. If you integrate that one, you also regenerate the original piece. Variation 10 won't be included for listening, but let's consider it anyway. Take a sound recording of the original and subtract it from silence or white noise - what does that sound like? - it is exactly the performance out of phase, and sounds exactly the same as the original- but if added back to the orginal, it cancels out and you hear no sound at all in the case of silence, or white noise alone if that's what you started with.